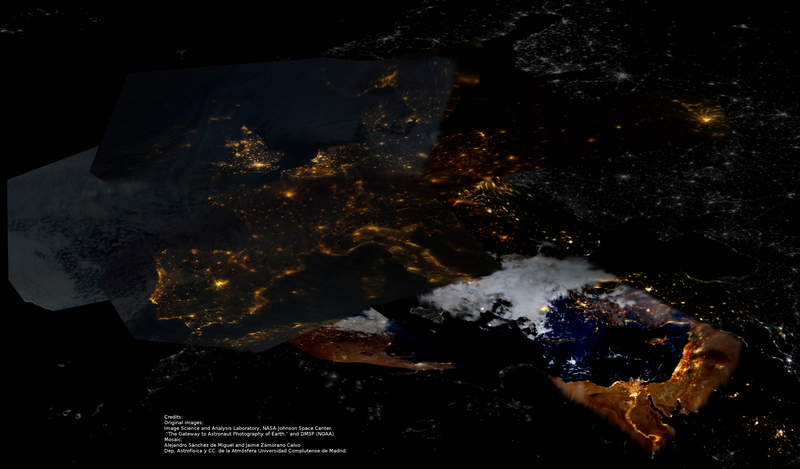 Light pollution from the space: Europe, Middle East and the U.S. 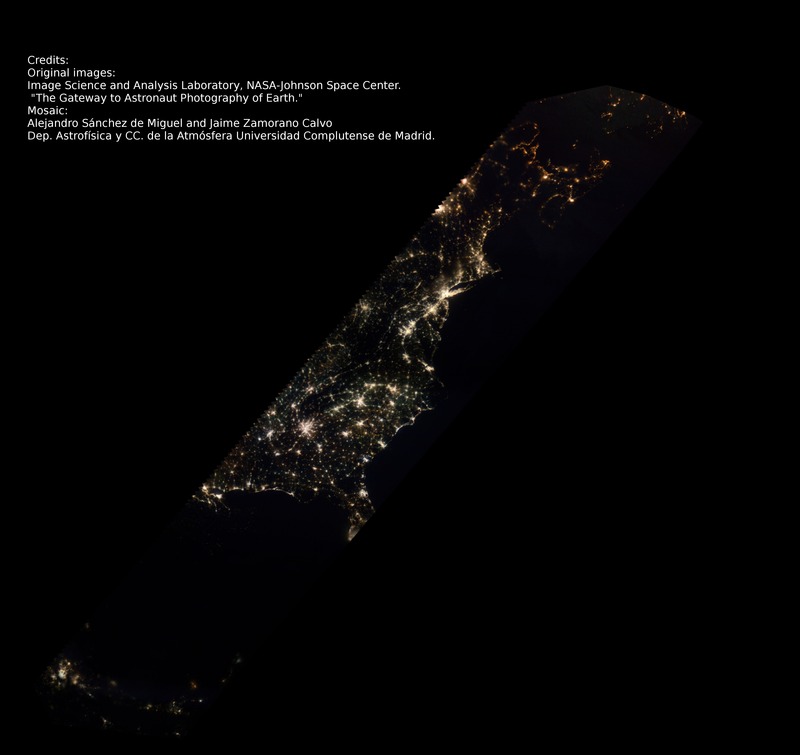 The Universidad Complutense de Madrid group of Extragalactic Astrophysics and Astronomical Instrumentation (GUAIX), member of the cluster of Global Change and New Energies in the International Excellence Campus Moncloa have combined night images of the Earth obtained from the International Space Station (ISS) with the objetive of make mosaics to study the light pollution in large areas. 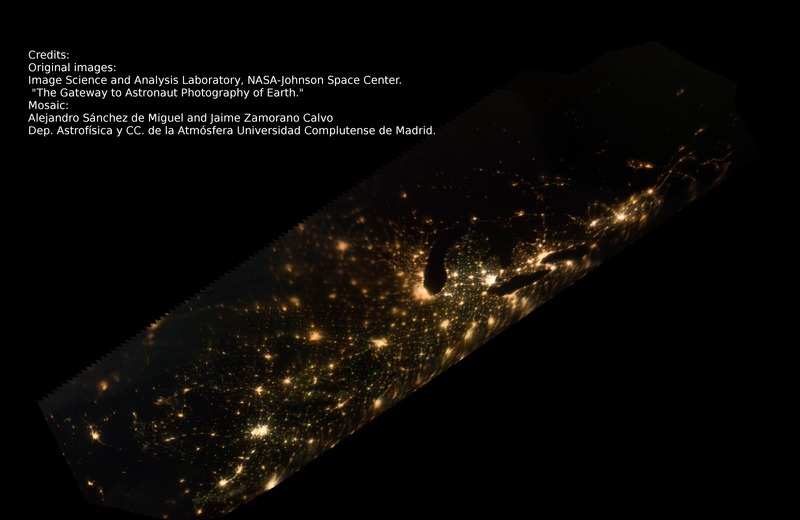 Coinciding with the International Week Against Light Pollution, they have released the result of combine more than 1000 images over Europe and The United Estates of America. The intensity and the colors of this images could be used to determine the type of lighting of the countries and calculate like never before, the electrical consumption and the energetic efficiency in street lighting. Light pollution is evident in these images have great impact on human health and the environment. Image mosaic of Europe, northern Africa and parts of the Middle East in color (ISS).Background image black and white DMSP (NOAA). Original images of Image Scienceand Analysis Laboratory, NASA-Johnson Space Center, "The Gateway to AstronautPhotography of Earth." Mosaic: Alejandro Sánchez de Miguel y Jaime Zamorano Calvo, Dpto. de Astrofísica y CC. de la Atmósfera UCM. 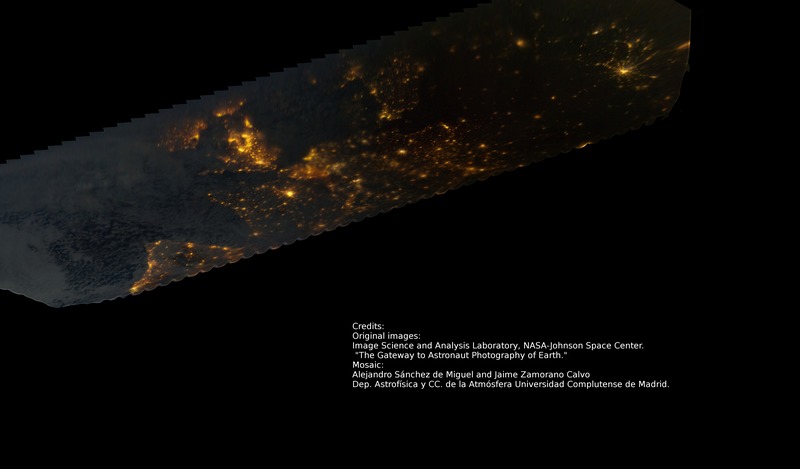 The study with high resolution images at night also allows to measure the intensity of lighting, source of light pollution and determine its color. It has recently demonstrated the importance of the type of lamp used, since several studies have revealed the negative impact of blue/white light on human health and the environment. 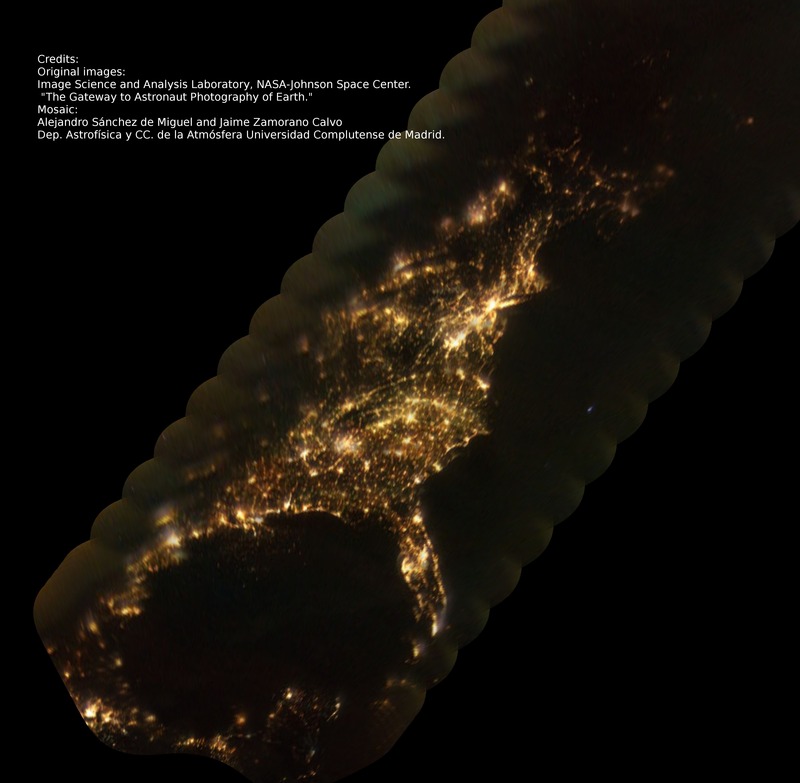 This map was made using thousands of photos taken by astronauts aboard theInternational Space Station. The final mosaic and distortion correction has been a work of the staff of the Dpto. de Astrofísica y CC. de la Atmósfera UCM unfoldmentthrough new procedures and software tools free. According to Alejandro Sánchez de Miguel, prior to the images obtained from ISS images were only available for large areas of the Earth provided by the DMSP satellite(NOAA) without color information. 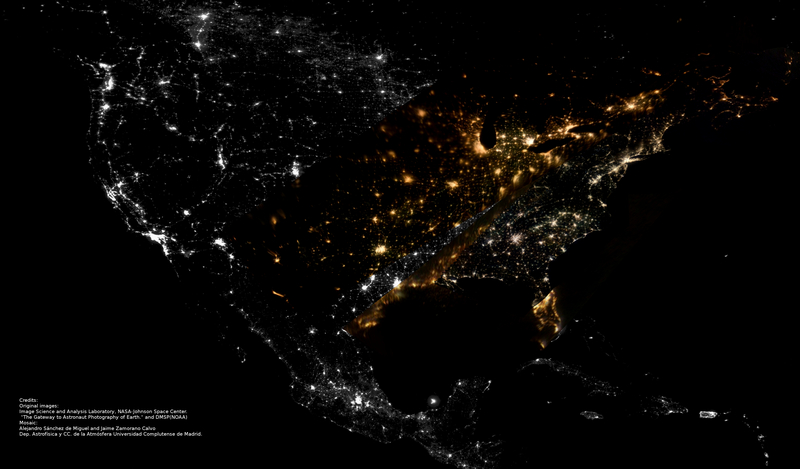 These images also prevented measure the brightness of the most populated areas because they are saturated. The images of these mosaics were made that were taken with digital cameras capable of recording in three colors (R, G, B) and provide more information to have a greater range of intensities. Our research group works in the absolute calibration of these images to determine the flux emitted into space from each region of the Earth. One objective of this research is to calculate the lighting energy expenditure independently of official statistics provided by countries. 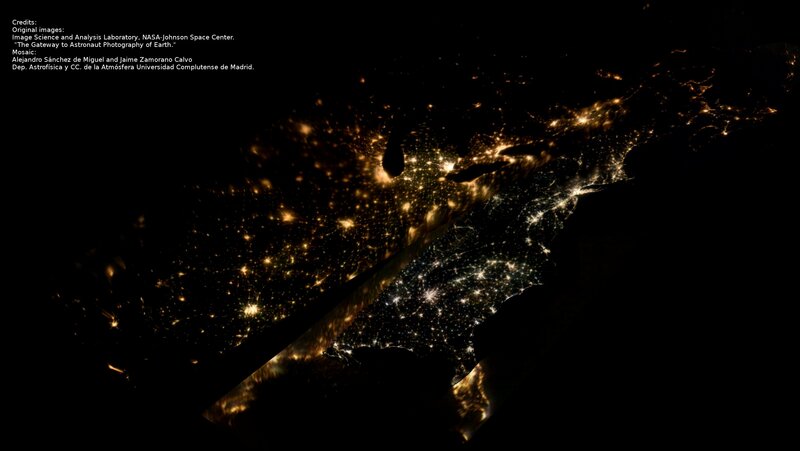 The minimum expenditure in the EU in street lighting could exceed 4,000 million euros / year in Spain 450 million / year. This publication is made on the occasion of the International Night in Defense of Dark Sky. The International Space Station (ISS) is a collaboration between space agencies National Aeronautics and Space Agency (NASA) of the United States, the Russian Space Agency (Roscosmos), the Canadian Space Agency (CSA), European Space Agency (ESA) Japanese space Agency (JAXA) for joint development, operation and utilization of a permanently inhabited space station in Earth orbit. Images taken by astronauts on the ISS are stored in the database maintained by NASA's Image Science and Analysis Laboratory, NASA-Johnson Space Center and can be downloaded by accessing "The Gateway to Astronaut Photography of Earth." 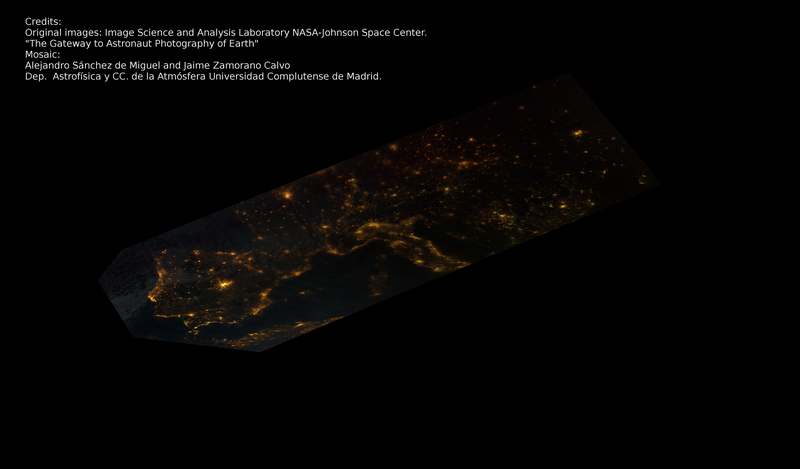 The group of Extragalactic Astrophysics and Astronomical Instrumentation (GUAIX) of the Universidad Complutense de Madrid working on the study of astronomical quality of the night sky and in particular on the impact of light pollution in the sky background brightness. Contributors to this study (apart from the authors): Jose Gomez Castano, Maria de los Angeles Lopez Cayuela, William Martin, Sergio Pascual, Francisco Ocana and Elena Cerezo.